Here are a couple different offers for Valentine’s Day. Folks, you have 4 more days until the big day. If flowers are on your to do list, check out these offers. 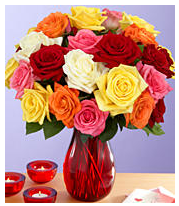 ProFlowers has a free glass vase and fresh flowers from $19.99. They offer flowers, chocolates, bears, and more available for Valentine’s day. Telefora is offering 15% off your purchase. If you order early enough, they’ll give you 20% off. Offers Feb 10, 2011 in flowers, holiday, ValentinesDay · Expired!